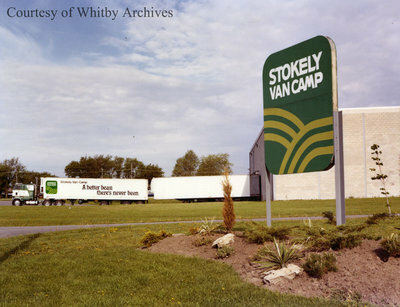 Stokely-Van Camp of Canada Ltd.
Colour photograph of the Stokely-Van Camp of Canada facility in Whitby. Stokely Van Camp canning factory was built in 1943 on the site of the former Metcalfe Foods Ltd. factory. The factory was located on the west side of Brock Street south of the C.P.R. tracks. "Stokely-Van Camp of Canada Ltd. Manufacture of canned food products"
Stokely-Van Camp of Canada Ltd., ca. 1983, photographer unknown. Whitby Archives photograph D2016_004_001.